Today's customer support and IT service organizations are charged with supporting ever-more complex environments that include multiple channels of communication to a seemingly limitless number of devices and systems-all while keeping support costs down. To meet these conflicting demands, service organizations are turning to remote support solutions. But as these remote support systems grow in sophistication, it becomes challenging to evaluate available choices. 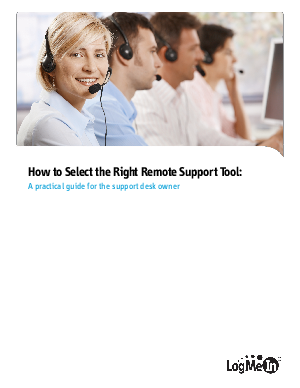 Download this guide to understand the factors that impact the purchasing decision of a remote support tool whilst providing a checklist for use as you work through your remote support solution selection process.